Challenging Chef Jet Tila holds the Guinness World Record for World's Largest Stir Fry. Will he throw Iron Chef Morimoto into the blazing wok, or will he be tossed to the flames? 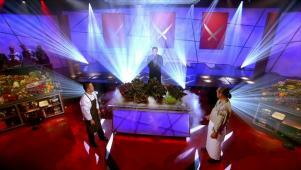 Chef Jet Tila challenges Iron Chef Morimoto to a seaweed battle.